No I‘m pretty sure it‘s Vulcan Grey...Spock‘s favorite color! There's that brownish shine of the Agate Grey on that snap! Vulcan is more cold grey than Agate! Wish they'd make available Vulcan or, better, the new Quarzite Grey of the new Cayenne on the 992! Agate. Like the interior Agate. Very nice contrast with many backgrounds. Not sure that is even Agate,....kinda has a green-ish tinge to it,...but could be. If it is a new grey they should name it "Awful Grey"
Just can't imagine how dull the US has gotten with colors lately. Stop at any intersection and all you find are multitudes of grey. Even the normal "safe" colors (black, white, silver) are now turning shades of grey. 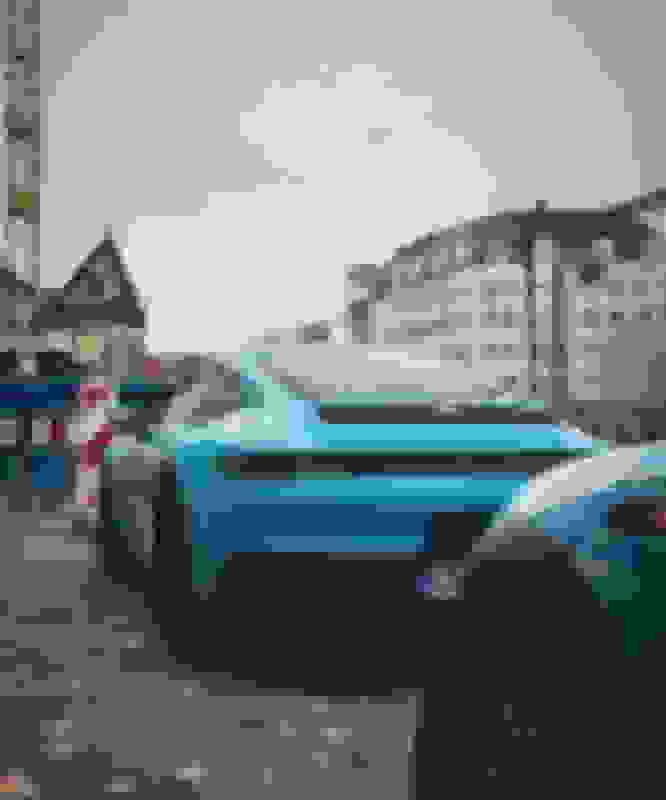 Last edited by Rocket_boy; 11-13-2018 at 11:29 AM. Location: In my Racing Yellow 911 Carrera T! Here’s a non-grey one for you! MB looks good on 992. Lightens up some of the heaviness a bit. Front bumper looks weak and the front fender flares look wacky. Still not feeling this car at all. 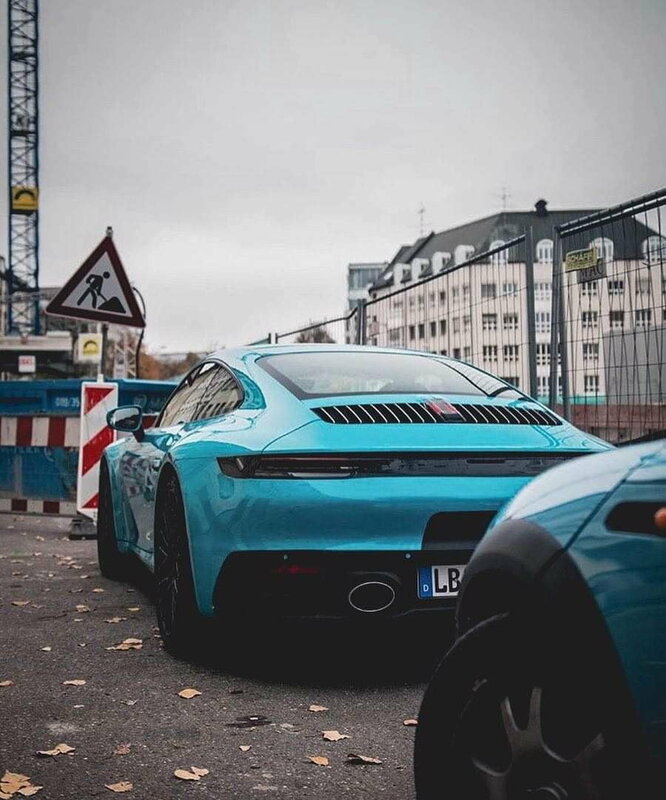 Agreed on the Miami Blue looking awesome on the 992 in that pic. That new metallic blue looks great imo. Wow, the clam looks god awful in that video. Looks like the car’s bombing into a corner with the trunk open. And it seems they’ve managed to make the car sound even worse. Mufflers can always be deleted. That tends to help. The clam.... is... the clam. I could live with it. The CHMSL booger on the engine cover is still hideous. I, too, love that new metallic blue. I'm on the list for a 992 Targa and a Cab, and one of them will be that color. As for the "clam", I have no problem with it. I does what it's supposed to do, I will almost never see it when it's in the raised position, and I don't think other drivers will give 2 s**ts about it. My 991.2 sounds great to my ears, and I'm sure I'll be pleased with the new car. Archimedes, we get it. You hate the 992, the 991.2 and the general direction in which Porsche and the 911 is heading. Go to the forum of whatever car you actually like, whether it's Porsche or not, and exchange some useful information with other forum members. Your constant criticism of the 992 and Porsche in general on this forum is getting quite tiresome.